This lighthouse is well on its way now - just the top section to do and I can sew the all the bits together. Once it is pieced, the next question for me is what I do with it. This is quite big, despite me resizing the bits - it will finish about 30"long, I think, and somewhere around 25" wide, so it wouldn't take many to make a quilt, especially if I mixed them up with something else. Alternatively I could make some smaller ones to add into the mix. Not sure. 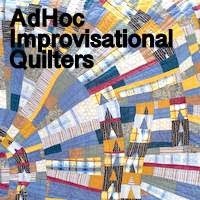 While I ponder I am linking up with Monday Making at Love, Laugh, Quilt. I like where this is headed. The sky fabrics look great. Your lighthouse is looking very good indeed! I love that fabric with the white birds. I think I've got to the point where I can just enjoy your project, without needing to try free-piecing too. I have an ambitious idea, but hopefully it can wait! Would you say that you are enjoying the process? I love it Kaja! So very much! 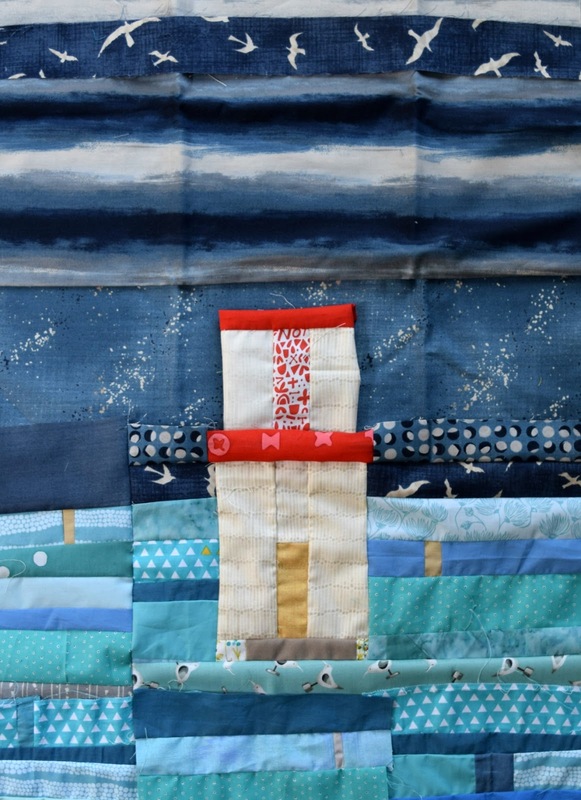 Now I know how you like for things to be useful and not simply beautiful to look at ...what if you put what you have in a lower corner of the quilt and built the sky and the sea out from that until it was a lap size quilt? I just love the sky/bird fabric in the mix. What a treat to watch you build your lighthouse! I recently made one, too, so especially enjoy yours. And I had some of the navy with seagull fabric. I like how you used it. I really like all that blue and the pop of red, Kaja! The sky is beautiful. This is all coming together beautifully, you're going to have a really special free pieced quilt at the finish.